An unexplained event happened in the early morning skies in February above Los Angeles of “not earthly” aircrafts in 1942 that inspired director Jonathan Liebesman to make “Battle Los Angeles”. Witnesses of what many thought was an attack on the U.S. by Japanese bombers saw what looked like a UFO -not a plane nor a balloon. The most mysterious part that has never been solved is that anti-aircraft guns couldn’t hit it. 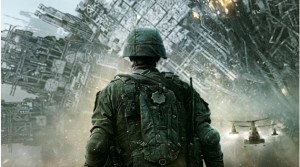 “Battle: Los Angeles” is a take on what if that event had turned into a full-fledged war brought-on by extraterrestrial aliens. An intrusion on Santa Monica, California by aliens is soon followed in multiple cities world-wide and becomes a global war. Older Sargent, SSgt, Michael Nantz (Aaron Eckhart) leads the local unit in fighting the over 7-foot tall robotic looking alien fighters with TSgt. Elena Santos (Michelle Rodriguez), 2nd LT. William Martinez (Ramon Rodriguez) at his side. Civilians found and protected by the troop consist of three children, a father, and a love interest for Nantz, Michele, portrayed by Bridget Moynahan. “Battle: Los Angeles” is an interesting mix of last year’s alien war sci-fi/action film, District 9, 1996 film starring Wil Smith, Independence Day, and director Oliver Stone’s Vietnam war film Platoon with a bit more battle scenes. Looking for a visually stunning war roller coaster ride? This is the movie! Loaded with tons of nifty shaky camera work. Some human qualities come-through strongly around the endless blasting of aliens that consist of loyalty, selflessness, and finding the strength to fight the one thing that scares humanity the most – the unknown.